It never rains but it pours for a number of coastal regions around the UK after recent statistics showed these areas are most susceptible to business distress. New statistics for Q4 2013 from Red Flag Alert - the business database owned by Begbies Traynor Group - reveal the towns and cities across the country with the highest levels of corporate hardship and the results paint a familiar picture of coastal demise at a time when the UK coast continues to take a battering from the elements. The beleaguered south-west region, which has seen several thousand homes and businesses flooded in recent weeks, features prominently in the financial distress league table 'top 10' with Weymouth (14.0% of businesses in distress), Dorchester (12.4%) and Newton Abbot (12.2%) occupying the top three places and Torquay (11.5%) in ninth position - significantly higher than the UK average of 8.8%. 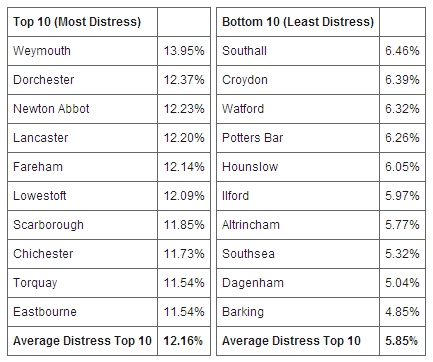 All towns and cities at the top of the 'most distressed' table could be deemed coastal with Lancaster, Fareham, Lowestoft, Scarborough, Chichester and Eastbourne completing the top ten. “Our research highlights the challenges facing coastal towns such as Weymouth and the broader South West region, which rely heavily on tourism and agriculture, even before the devastating effects of the recent severe weather. Businesses in this region, which are already vulnerable during the winter months due to lower visitor numbers and therefore reduced local spending power, now face the immediate challenge of dealing with further business disruption from the damaging effects of bad weather and incessant flooding. In contrast, London and the south-east continue to be the healthiest regions for business; demonstrated by the opposite end of the league table which outlines the lowest levels of business distress and contains eight towns or cities from these two thriving regions. With distress rates of 4.9% and 5%, Barking and Dagenham are the best performing towns or cities in the UK at present whilst Southsea and Altrincham are the two areas experiencing the lowest levels of financial difficulty outside of London at 5.3% and 5.8% respectively. “It appears that the South East continues to go from strength to strength, as London outpaces the rest of the UK economy due to its attraction as a hub of international activity and investment - not to mention increased confidence across the region as a result of house price rises, and continued public sector spending on large infrastructure projects." *Flooding image used in accordance with Wikipedia Fair Use policy.